We are equipped to attend site, carry out an inspection, provide a full report with suitable advice and carry out any repairs or remedial works. Expert care is taken in the research of every component to ensure it is exactly in line with what is required. Alternatively, we can remove the job to our workshops at Cromford, Nr Matlock. We can also take care of logistics for you. Large or heavy artefacts are easily transported to / from site using our own crane lorry and all our large scale tooling is fully transportable. CNC lathes, manual lathes, vertical milling machines & borers. We have the capacity & skills to machine new or re-machine following repair. Cylinder blocks, slide valves & slide valve faces are some examples. Bespoke tools are often hand-made for specialised tasks. Full or partial dismantle and re-buildsto include welding, riveting, repairing, replicating and replacing parts (including chemical analysis if necessary). We have years of experience in steam engine and locomotive repairs and restoration. We have honed our skills from working on building restoration, replication and/or repair including historical landmarks, bridges, bridge supports, facades, arches, chimney stacks & parapets. We love working with cast iron and we pride ourselves in supplying a professional and authentic finish. We have a vast range of components used throughout industry including cast iron brackets, riveting, pump housings, waterwheels etc. We specialise in industrial heritage conservation and strive to restore industrial machinery to its full authentic working capacity - be it extremely large or very small. We have a team of technicians skilled in the use of CNC lathes, manual lathers, vertical milling machines & borers. We can machine new or re-machine following repair. 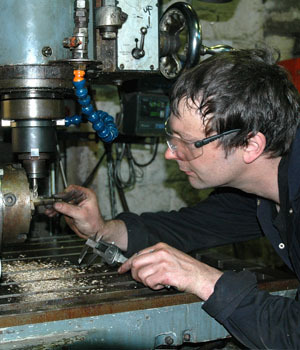 Bespoke tooling is often hand-made for specialised tasks.